For the past 3 weeks we have merrily ventured through the kingdoms of Christmas Ales and enchanted Winter Warmer wonderlands. For the next 12 days we bring you a sampling of diverse beers from around the world that are purely divine by nature. These are the splendid spirit-lifting brews to enjoy with family and friends as we celebrate this special time of year. Some of these delightful beers are found in weeks past and in week’s future, others will be making a cameo appearance because of their special connection to the season. From the land of Santa Claus, it’s the granddaddy of all Baltic Porters. This is truly an original! This is a prime example of a beer crafted with care, attention to detail and love. The color is like strong, dark coffee. Lovely aromas of chocolate malt, smoke, coffee and dark rum vie for attention. The full and rich body envelopes flavors of coffee, rye, dark chocolate and a bit of licorice. An abundance of sharp-edged fresh hops, citrus bitterness and hint of spices provide a lively bite. It's slightly smoky with an essence of pine in the background. This powerfully flavored brew has a bit of an alcohol kick, yet it remains very drinkable. This "vintage" Baltic Porter ages very well, when cellaring at around 55°F. The flavors and aromas change ever-so-gradually. You can expect this brew to last 6 to 7 years. I highly recommend this wonderful example of the Baltic Porter style! Factoid: The Kalevala, the national epic of Finland manages to describe the creation of the world in 200 verses, but requires 400 verses to explain the creation of beer. This is a Christmas/winter seasonal - Must Try! Although, it is available year-round. Deep golden bronze/amber with a tint of red. Very complex dry robust malt with a trace of sweetness. Powerfully hopped, then dry hopped for good measure. The maltiness rolls forward throughout the glass and begins to reveals a trace of berries and some smoothness. An unusual, but nice pine essence is long lasting. The alcohol is noticed, though not overly so. The creamy beige head lingers and nice lace is formed. As with all of D.L. 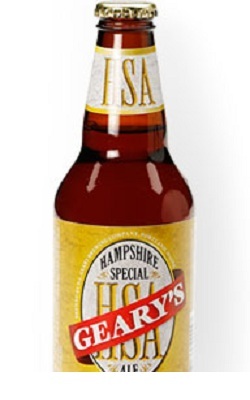 Geary’s brews, there sort of a raw wildness, like Maine itself. It’s easy to picture a Norman Rockwell Maine coast pub scene in winter where the cheerful patrons are toasting one another with a frosty mug of Hampshire Special. Now that really warms the heart! 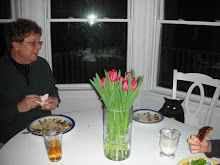 BTW  Hampshire Special pairs really well with hearty stews. Try braising a roast with this ale in place of Burgundy wine. For the past 3 weeks we have merrily ventured through the kingdoms of Christmas Ales and enchanted Winter Warmer wonderlands. For the next 10 days we bring you a sampling of diverse beers from around the world that are purely divine by nature. These are the splendid spirit-lifting brews to enjoy with family and friends as we celebrate this special time of year. 16.9oz dark brown swing top bottle. Bottled in 2006. Rated in 2007. Served in a Piraat chalice. 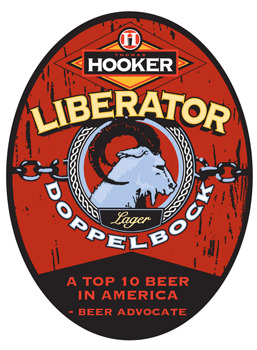 This amazing Doppelbock pours a very dark and deep ruby-hued mahogany color with a fast-fading beige head, along with thin scattered patches of lacing.